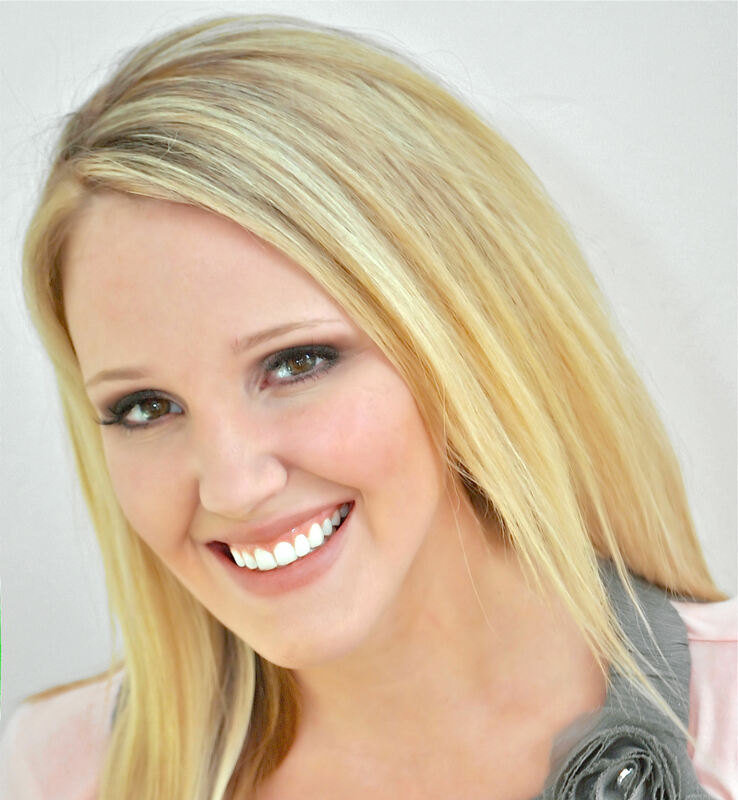 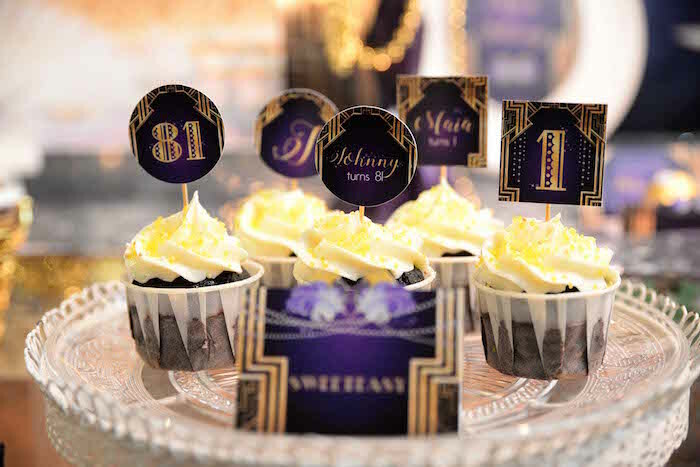 Love the classic Roaring 20s Era?! 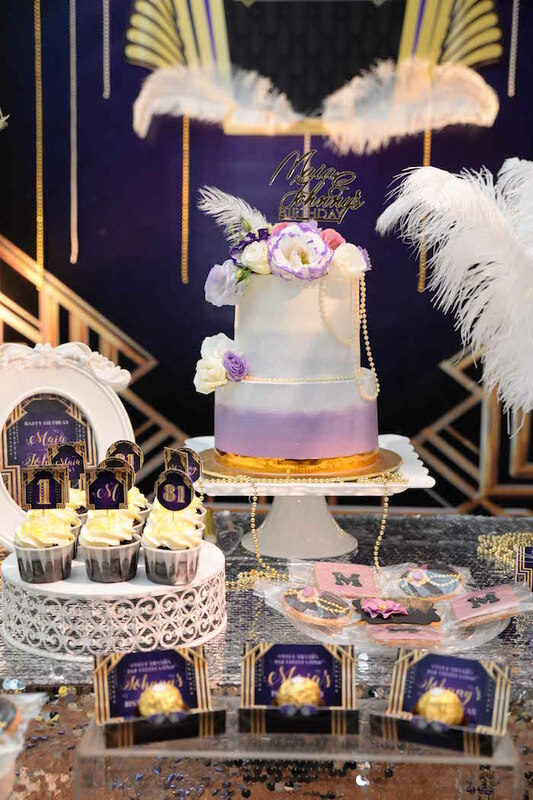 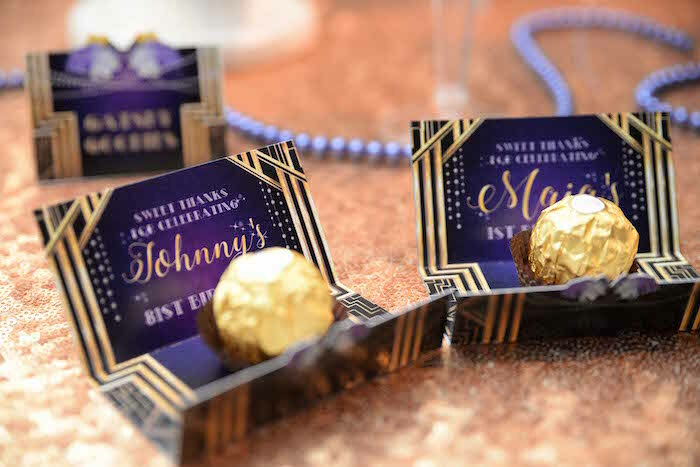 You will die over the incredible details featured in this Great Gatsby Old Hollywood Birthday Party submitted by Daphne Seow of ParteeBoo, out of Penang, Malaysia! 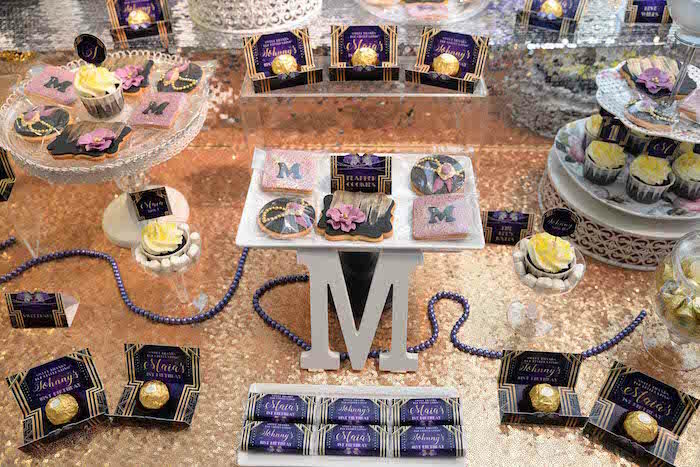 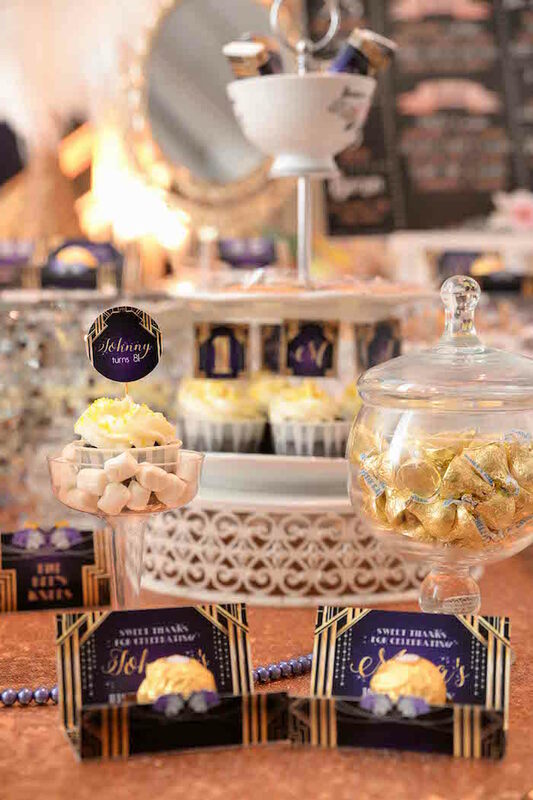 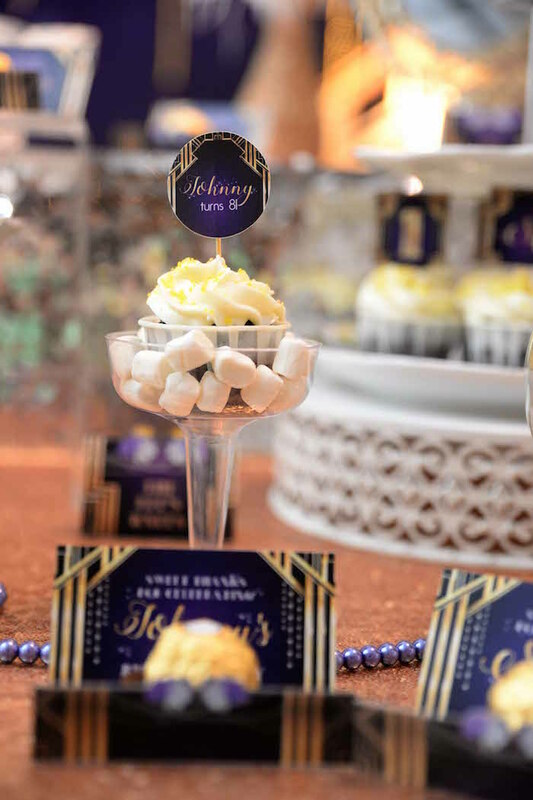 Its beautiful gold, purple, silver and black color palette, along with its gorgeous sweets and vintage decor, is sure to captivate and draw you in! 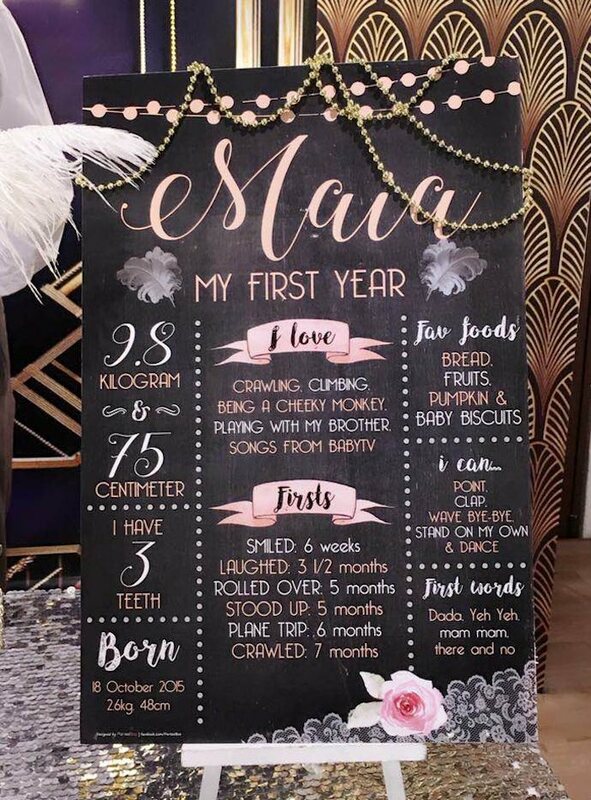 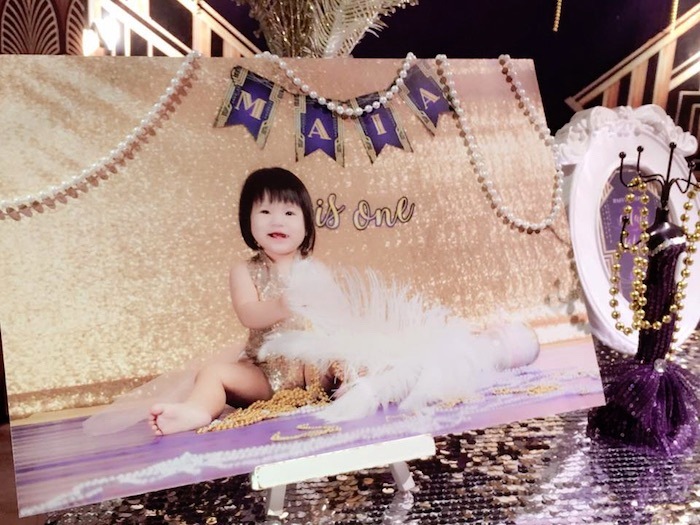 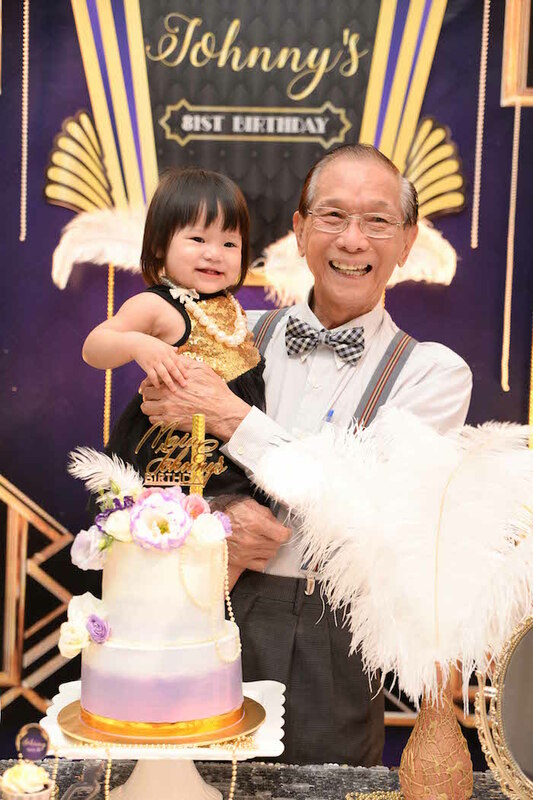 This is what Daphne shared about the party- “It was an exciting and wonderful celebration for Maia who was able to celebrate her 1st birthday together with her grandfather, Johnny, who celebrated his 81st birthday! 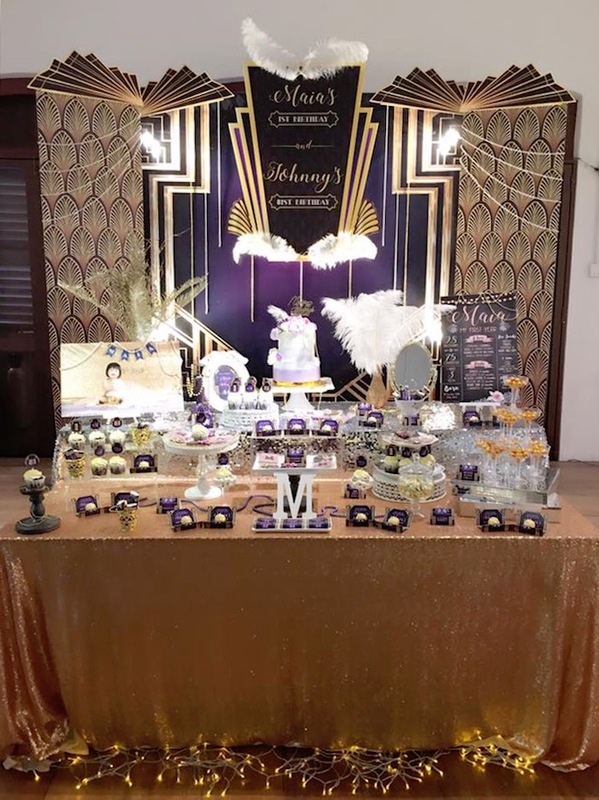 The theme for the party was The Great Gatsby (for the Great Gats-baby, Maia!) 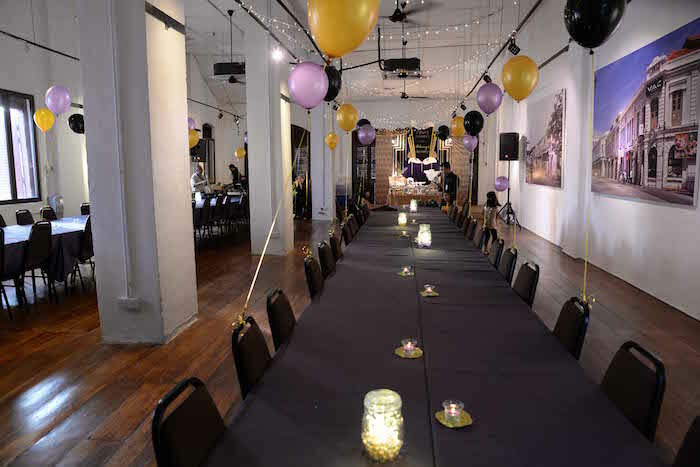 and the venue was just perfect with it’s vintage-like interior (being an old pre-war building). 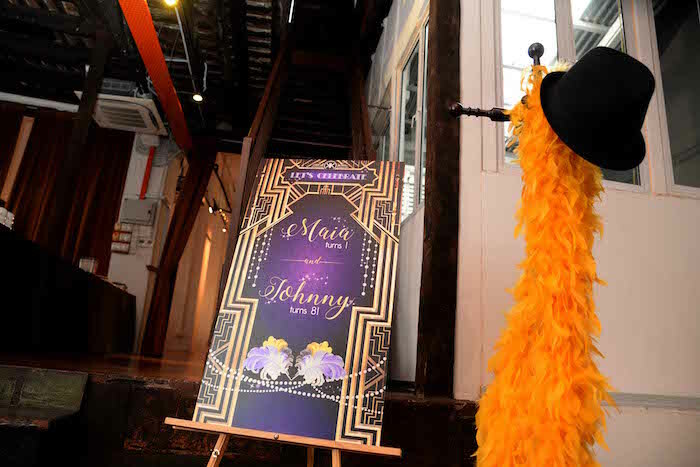 The decor was full of drama, bling and feathers! 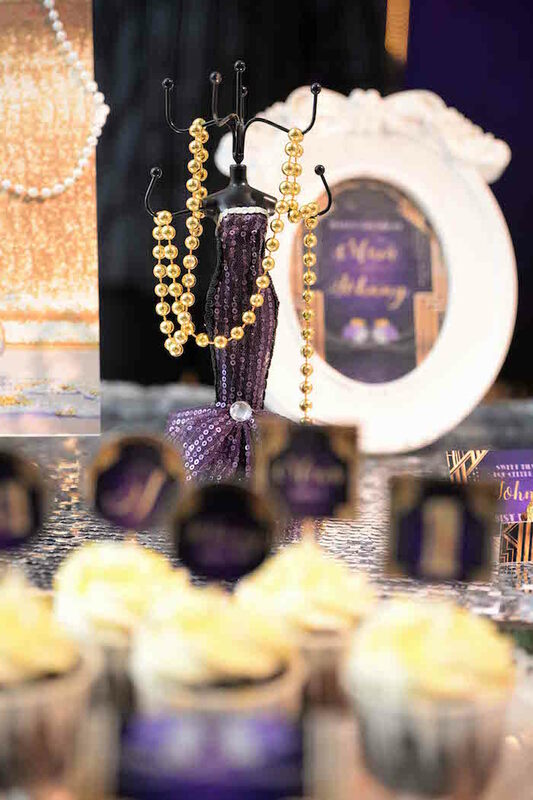 We love the dramatic gold, black and dark purple theme colors for the decor. 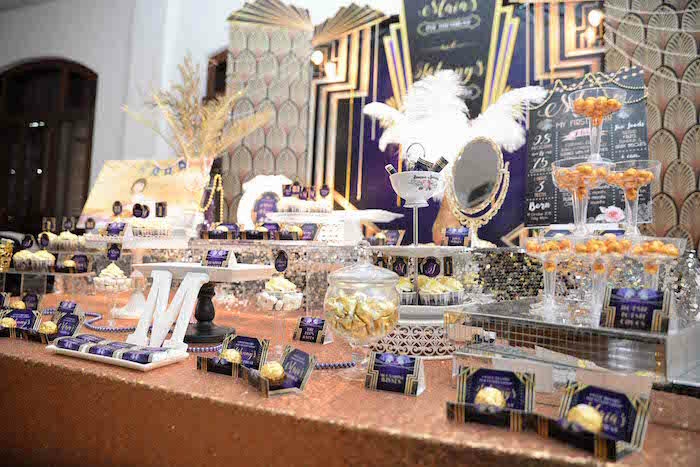 And the sequin table cloth, white feathers, pearls and lights brought the Roaring 20s to life! 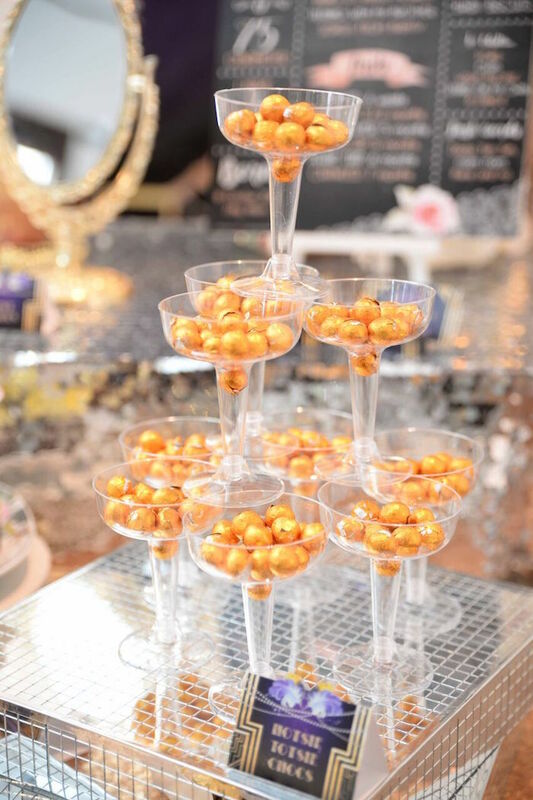 The dessert table was simply amazing! 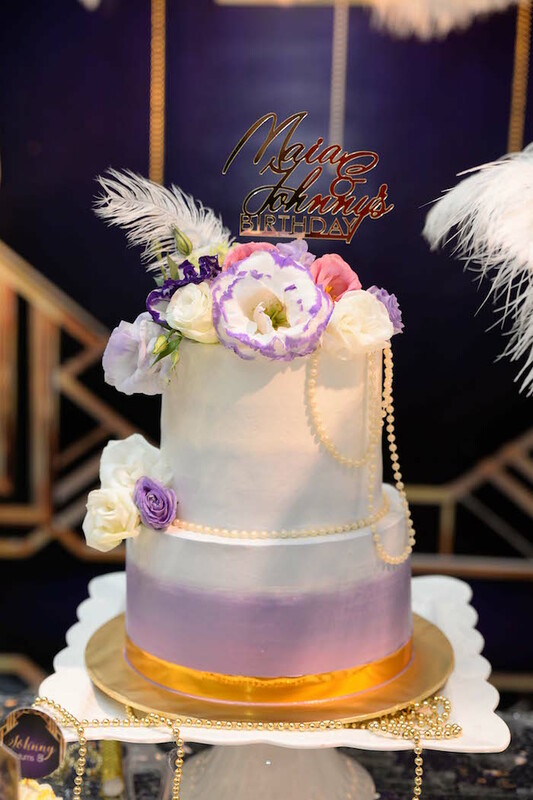 Firstly, there was a stunning 2 tier cake that absolutely suited the Gatsby theme. 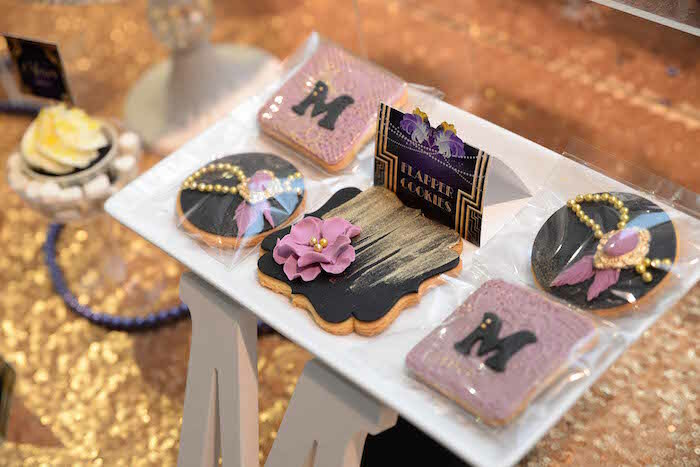 The fondant cookies were just too beautiful to eat with its intricate designs. 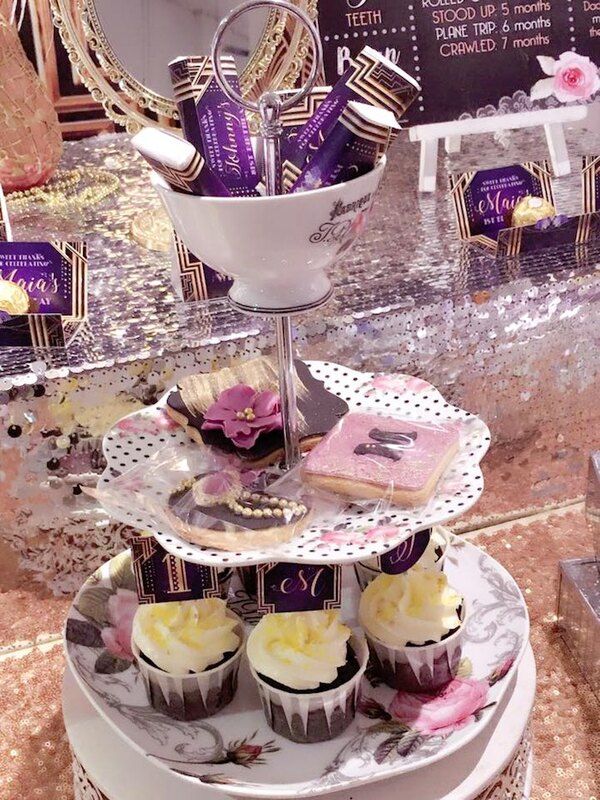 There were cupcakes with customised toppers, Ferrero Rocher chocolates with customised holders, a chocolate champagne “fountain”, gold Hershey Kisses and Kit Kat chocolate bars with customised wrappers. 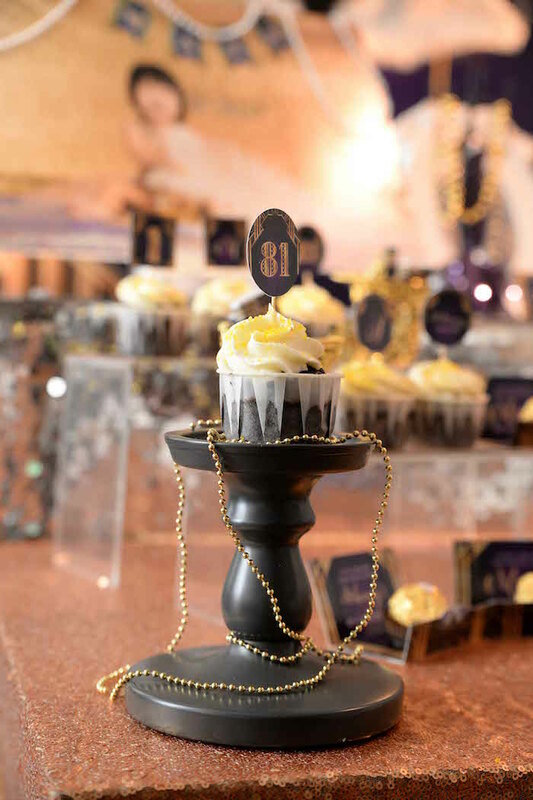 For the venue decor, helium balloons in the theme colors were placed round the venue. 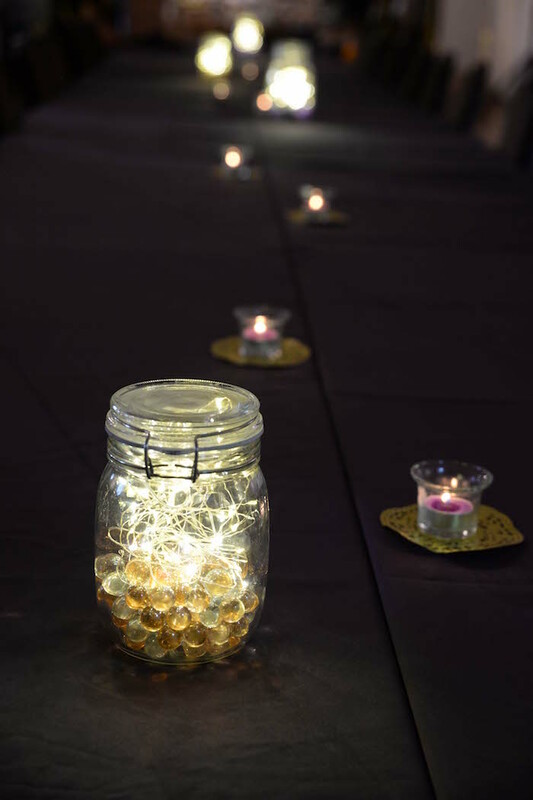 Fairy lights were placed in mason jars along with candle tealights to decorate the guest tables.